Discussion in 'Mac Basics and Help' started by DeafRaiders, May 2, 2013. I have a Seagate 1TB external HDD for backup after 5 months of using it since the new year is it full! How can i delete previous backups and keep the current and latest version of Time Machine Backup? I was a bit confuse i thought it backup only the latest one and deletes the one from a month ago or so. Any advice will me much appreciate. I don't want to go out and buy another one i have 2 one for my facebook and photos backup and one for the time machine. It should delete old versions on its own to make room for new backups. How big is the drive in your computer? Is this the message you are seeing? If that is what you are seeing, it is normal and just letting you know it will start deleting old versions of backups. You can just check the box if you don't want to see the warning any longer. It will just delete old versions and keep the most current. The box appeared again, It just won't backup now. Won't delete the older backups too. I have 3 videos of family holidays to process will this probably be the issues that is taking up the space? It sure could be. What size are the videos? They are a few gigs. 15Gb in total. Guess it will be them will need to get them done over the weekend. What is the size of your OS X HD, how much is used and do you have any other HD that are TM backed up? i have removed some stuff like over 20GB still won't backup saying that 303KB left on the TM backup disk drive. I haven't backup since 29 June I am dreading it. please help! Is it worth purchasing an 2TB HDD? You should of course be able to backup 400GB of data to a 1TB drive. It sounds like maybe your aTime Machine back is corrupted. 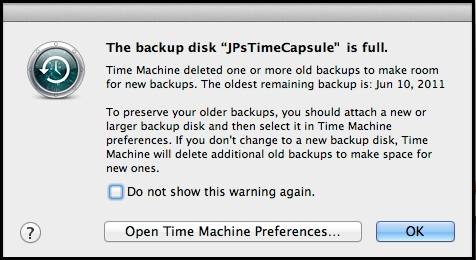 I would use Disk Util to erase the backup disk and start over with a new Time Machine backup. I had a similar question concerning a 2 TB b/u I installed to save a ton of professional photos of mine. No warnings yet as, I suppose, the Seagate is the 2 TB model. I was told that I should get a second one and b/u the new one with the computer HDD and photos and keep switching the 2 back and forth to make sure I din't lose anything should there be fire or flood. Or, even an angry wife. Any suggestions are appreciated. Here's an idea - Create a folder on your computer to house your "working videos". Go into Time Machine and exclude that folder from the backups? Perhaps too many older backups require deletion for Time Machine to handle disc space correctly and it's just freezing on it. Backup the video's another way for the short term. Save final (mp4/mkv/whatever) files outside of that freshly created working folder for backup via TM.